The IIID (Institue of Indian Interior Designers) SRC & IIA (Indian Institute of Architects) SC invite you to a presentation by Abraham John Architects. The presentation will be held on 04 May 2013 in Surat, Gujarat. 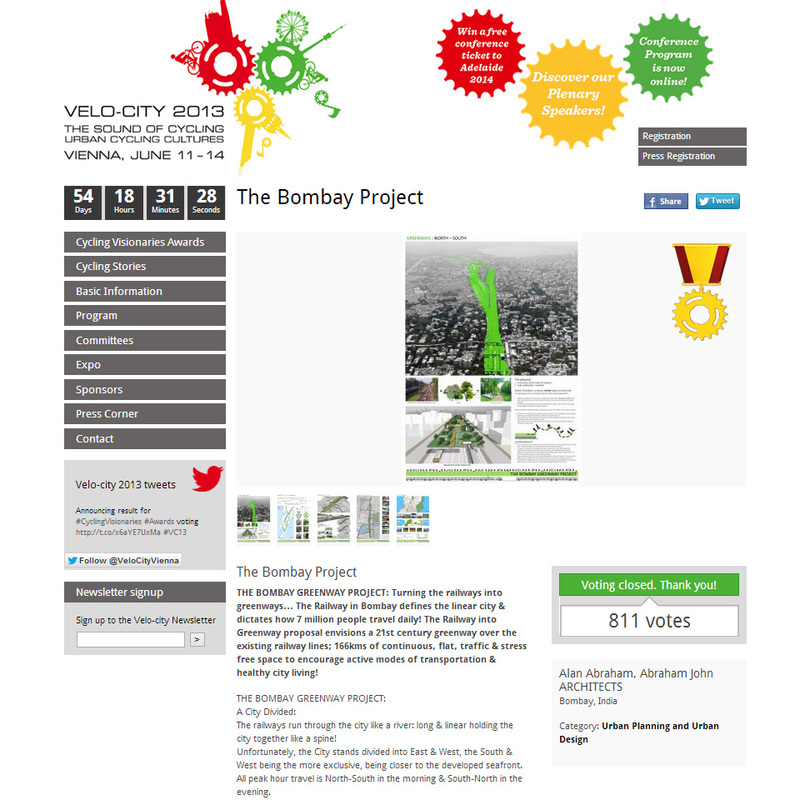 THE BOMBAY GREENWAY PROJECT WINS VELO CITY 2013 !!! We are very glad to announce that we have been declared the WINNERS in the International Urban Planning & Design Competition Category of the Cycling Visionaries Award hosted by Velo City 2013. The Awards will be held in June 2013 in Vienna, Austria. Alan Abraham was invited as guest speaker for Autodesk Revit 2013 Seminar held on 05th Oct 2012, where they showcased some projects executed in Revit. Alan Abraham was felicitated as one of Architect & Interiors India’s iGEN Top 50-The New Generation of Innovators in Architecture-March 2012. A high-end project was the first Indian project to be featured in Vogue India.